The Akan Drum is a drum that was made in West Africa and was later found in the Colony of Virginia in North America. It is now the oldest African-American object in the British Museum and possibly the oldest surviving anywhere. The drum is a reminder of all three continents' involvement in the estimated twelve million people transported across the Atlantic as part of the slave trade. The drum is normally displayed in room 26. The drum is made from two species of wood that are native to sub-Saharan Africa, Baphia and Cordia africana. The latter fine-grained hardwood is known for its ability to be carved and its resonance, which makes it suited to musical instruments. The drumskin came from a deer hide and was stretched over the wooden structure using vegetable fibre. The drum was made in the Ghana region of West Africa between 1700 and 1745, and is presumed to have travelled to America on board a slave ship. As all the slaves left with nothing it is presumed that the drum was either brought by a member of the crew or possibly by a son of the African chief who had sold the slaves for transportation. To exercise their captives, the slave traders would "dance the slaves". It is supposed that this was why the drum was transported. The word Akan refers to the culture in what is today Ghana and includes the Fante, Asante and Akuapem people. There is a striking but unexplained similarity between the phrase "Akan Drum" and the phrase "Aiken Drum", used in British folksongs from the 18th century. 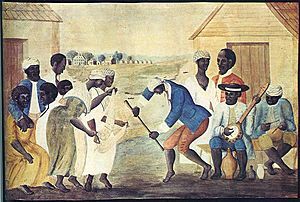 The Old Plantation - a late 18th-century painting showing slaves dancing with banjo and drum. This particular drum was obtained in Virginia by the Rev. Clerk on behalf of the British collector Sir Hans Sloane. Sloane had travelled through Jamaica and had observed at first hand slaves playing instruments including those that were to evolve into the banjo. Sloane gathered examples of the tools of slavery and other artifacts which included this drum. 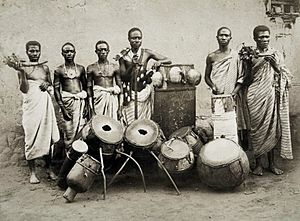 Clerk and Sloane thought erroneously that this drum was made by American Indians, however their trip to Jamaica confirmed that it indeed not only "African" but from the Akan people of Ghana, where the instrument was in abundance amongst others of the Akan such as the Seperewa harp. Sloane used his collection to found the British Museum in 1753, and the drum is still displayed there as part of the "Sloane collection". Sloane's catalogue records this item as "drum made of a hollowed tree carved the top being brac'd wt. peggs & thongs wt. the bottom hollow from Virginia". In 1906, curators at the British Museum realised that the drum could not have been created by Native Americans, but must have been made in Africa. In the 1970s, it became possible to use expertise from Kew Gardens to determine that the wood was grown in Africa. The drum is thought to have originally been made for a musician in an African chief's orchestra. This is the oldest African-American object in the British Museum and was part of its founding collection. This drum was chosen to be featured in A History of the World in 100 Objects, a series of radio programmes that started in 2010 as a collaboration between the BBC and the British Museum. 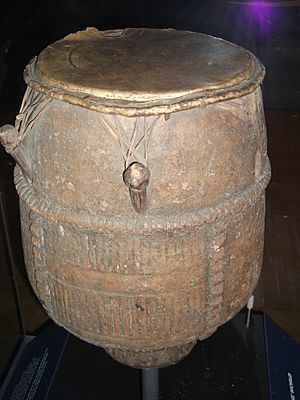 The drum has also been used as the lead object in a special display at the British Museum in 2010 called "From Africa to America: drumming, slavery, music". The exhibition looked at how this drum was used in the "dance of the slaves", but also as an example of the collision of cultures that was created by the slave trade that eventually led to jazz and rock and roll. The slave owners were unsure of how they should treat African music. On some plantations drums were banned. Akan Drum Facts for Kids. Kiddle Encyclopedia.